Adding some oozing cheesy goodness can only improve on that concept. Feel free to play around with your favorite cheeses. Preheat oven to 425 degrees Fahrenheit. Lay a potato on a cutting board. Arrange two wooden spoons or skewers underneath it, one on each side. Slice thin slices all along the length of the potato, but not all the way. (The sticks underneath will keep you from slicing all the way through.) Repeat with remaining potatoes. Line a baking sheet with foil and grease well. Place the sliced potatoes on the baking sheet. Smear well with melted butter and season with salt and pepper. Place in oven and bake for one hour. While the potatoes bake, sauté the scallions in two tablespoons butter. Slice the cheddar into thin slices. 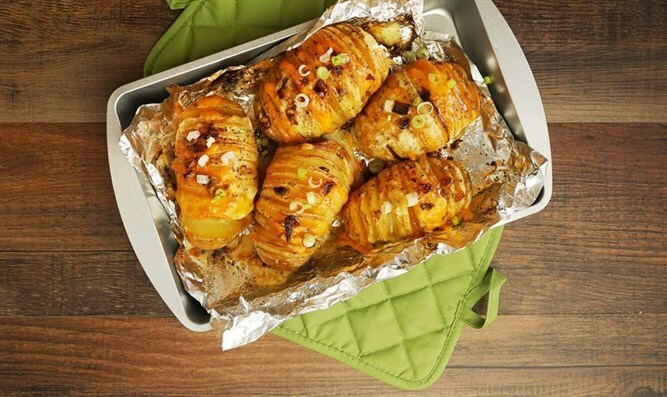 Remove the potatoes from the oven. Place slices of cheddar and Garlic Basil Jack cheese in the potato cracks. You can alternate the different varieties of cheese. Top each potato with some sautéed scallions, and smear with some more butter. Return to the oven and bake for another 30 minutes or until nice and crispy.